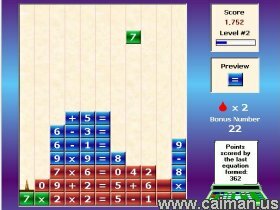 Caiman free games: Falling Formulas by Reasonable Games. It is a tetris clone with a mathematical twist! Instead of just filling up rows with blocks, you need to form mathematical equations in order to get the blocks to disappear. Falling numbers, operators, equals signs, bombs and more require rapid thinking in order to get the two sides of an equation to match up. You'll be surprised at all the strategies needed to reach the higher levels and get a high score. Be prepared for some serious mental gymnastics!! 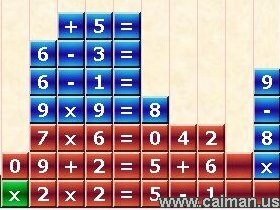 Falling Formulas is a one-of-a-kind tetris game where you have to make the left and right side of mathematical formulas equal for blocks to disappear. Not for the faint-of-heart. Falling Formulas was awarded 5 doves by Completely Free Software and called a "must-have" for Tetris Collectors.